← Garden City Iron & Metal Welcomes You to Our Brand New Website! There are various types of metal found all around the world, but all metals can be placed into one of two categories: ferrous or non-ferrous. The most distinguishing difference between ferrous and non-ferrous metal is iron. Iron is among the most common chemical elements on the planet, and found primarily in the Earth’s crust. When metal contains iron, regardless of how little the content, it is considered a ferrous metal. In contrast, non-ferrous metals do not contain any iron content. An easy way to remember this rule is to remember that non-ferrous means non-iron. So how do you tell the difference between a ferrous and non-ferrous metal? The answer is a magnet! If the magnet sticks to the metal, the metal contains iron, which would make it ferrous. You see, iron is a magnetic metal, so if a magnetic sticks, it must contain a sufficient amount of iron content. In some cases, the concentration of iron is too weak to attract a magnet, so additional equipment would be necessary in determining its true composition. Look below to learn some examples of ferrous and non-ferrous metals and their common applications. Wrought Iron: Composition is virtually 100% iron content. Common applications include fencing and ornamental gates. Cast Iron: This strong but brittle metal contains mostly iron, but also contains anywhere from 2 to 6% carbon. It is commonly used to make engine blocks and sewer covers. Mild Steel: Mild steel has a mostly iron composition, but also contains between 0.1 to 0.3% of carbon. Its primary application is engineering, but also non-specialized metal products manufacturing. Carbon Steel: Iron metal containing 0.6 to 1.4% carbon content. It is commonly used to make metal cutting tools and tool parts, like drill bits and bushings. Stainless Steel: A popular finish for home appliances, stainless steel contains iron, nickel, and chromium. Because it is stain and corrosion-resistant, it is commonly used to make surgical instruments and cutlery. Copper: A naturally-occurring element, copper contains no iron content. Because of its electricity and heat-transfer attributes, it is commonly used to make electrical wiring, tubing, and plumbing pipes. Aluminum: Aluminum contains manganese, copper, and aluminum content. It is highly malleable and lightweight, so it is commonly used in the aircraft manufacturing industry, but also for kitchenware, window frames, and more. Lead: Also a naturally-occurring element, lead is a soft, but heavy, metal. It is primarily used to make batteries, roofing materials, and pipework. Brass: Brass is made up of mostly copper, but contains up t0 35% zinc as well. It is commonly used to make ornamental commodities and electrical fittings. 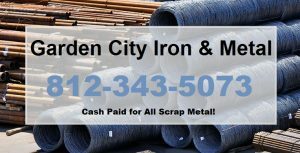 Call Garden City Iron & Metal at 1-888-586-5322 to recycle scrap metal and junk metal commodities in Central and Southern Indiana. We pay cash on the spot for both ferrous and non-ferrous metals, as well as, junk cars, automotive parts, appliances, construction equipment, motorized farming equipment, and much more! Get rid of your junk and make some fast cash at the same time. 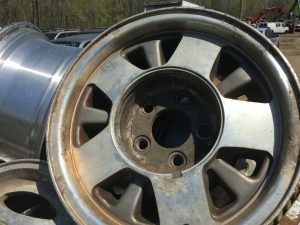 This entry was posted in Scrap Metal Recycling and tagged aluminum recycling Indianapolis, ferrous metals, iron, nonferrous metals, Recycle Scrap Metal for Cash, Scrap Metal Recycling. Bookmark the permalink.